I’m sure many of you are aware of the volatility and sell-off that has engulfed the stock market over the last two months. In fact, the Nasdaq, Dow Industrials, and the S&P 500 have all now moved into negative territory for 2018. But are you a “glass half full” or a “glass half empty” kind of person? Me, personally, I’m the glass half full type. I know this is just a pause in the market’s eventual move back higher. And just like the excellent Black Friday (and Cyber Monday) deals, the best way to view the market right now is that it’s on sale. Big time. If you’re itching to get your hands on a great deal, there are many high-quality companies that are ripe to scale into. But if you’re also hesitant because you believe more selling may ensue, then let’s walk through a great way to gain access to stocks with less risk and better returns. Buying call option contracts allow you to take a bullish position in a stock with a smaller upfront cash outlay. And, if successful, will yield a much better return on your investment. But which stocks should you choose and which call option contracts should you buy? I understand that not everyone is adept with the ways of options trading, but in all honesty, it really is quite easy to understand. Options are investments, just like stocks, because you can easily buy and sell them. As the option buyer, you pay an upfront “premium” to the option seller for the right to enter the trade. If you’re a call option buyer, you’re bullish. That means, if you want to play, you must be bullish on a stock. Walmart (NYSE: WMT) is one of my favorite stocks, and the biggest brick and mortar retailer on the planet. It’s also been a great long-term investment for those who bought within the last 10 years. It has recently pulled back from all-time highs. If you think it will continue its upward ways, as I do, what’s the best way to play it? Well, buying 100 shares at its current “Black Friday/Cyber Monday” price of $95.10 would cost $9,510. That’s a sizable investment. Using call options contracts instead can be a real game changer. Each option contract would control the same 100 shares. Using the option chain above, we can choose from various WMT call option contracts that expire in June 2019. This time frame can give stocks the chance to recover from the October and November swoon. My best advice is to always choose the cheapest call option, with at least a 90% Delta or greater. In this case, we can key on the $70 call options, which would cost $25.70 per contract (splitting the bid/ask). With the $100 option multiplier, buying one contract would cost $2,570 ($25.70 x $100). This option sports a 91.12% Delta. For every $1 move in WMT’s stock price, the option price would piggyback it by 91%. This option would also save you $6,490 in upfront costs. That’s a discount of 73%! It also means the most you have at risk is $2,570, versus $9,510 if WMT goes bankrupt. To calculate a call option’s breakeven, you add the option’s price to the strike price. In this case, it’s $25.70 + $70 = $95.70 per share. 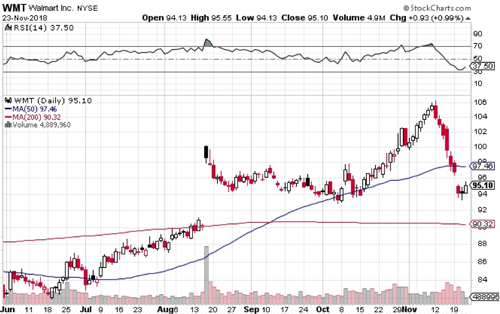 The $70 call option would start to make money as soon as WMT stock moves above $95.70. That’s an extremely easy price move for WMT. Let’s say WMT ends up at $120 per share by June 2019. The stock investment would yield a gain of $2,490 and a 26.2% return. 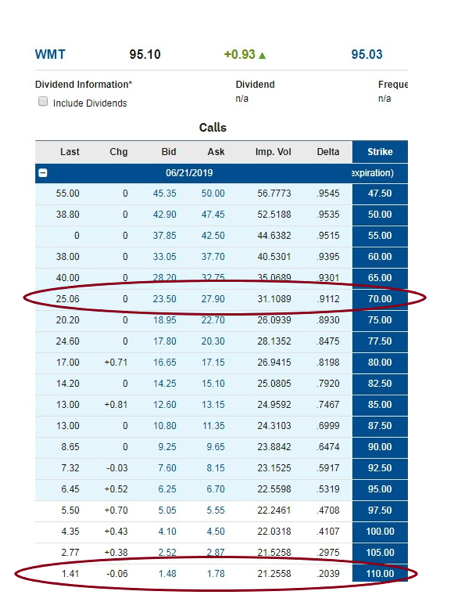 The $70 call option would be worth $50 per contract at expiration ($120 share price – $70 strike price) and yield a dollar gain of $2,430 ($50 – $25.70). That’s only $60 less than the stock gain. But the real kicker is the percentage gain, which would be 94.6% ($24.30 gain/$25.70 investment). That’s over three times better than the stock return (361% to be exact). Buying the $70 call option is a superior choice. Let’s look at a different option, one at the other end of the spectrum – the $110 call option. Buying the $110 call option would cost roughly $1.63 per contract. That’s a cash outlay of just $163. That’s $9,347 less than buying 100 shares outright, which equates to a 98.3% savings. The breakeven on the call option would be $111.63 ($1.63 + $110 strike) and the Delta is 20.39%. You’re not getting as much bang for your buck when the stock moves, so you must be really sure the stock will shoot higher. So how would it fare if the stock still goes to $120 in June 2019? Well, the call option would be worth $10 per contract ($120 – $110 strike), which would yield a gain of $8.37 ($10 – $1.63) and a return of 513%. But what happens if WMT closes at exactly $110 at expiration instead of $120? The stock would make $14.90 per share with a return of 15.7%. The $70 call option would make $14.30 per share with a return of 55.6%. And the $110 call option would expire completely worthless with a 100% loss. In this case, choosing the $110 call is not the best bet. Predicting how high a stock might move and when it will happen is extremely hard to do. Using a call option with a 90% Delta takes all the guesswork away. It acts just like a substitute for the stock. Picking an option with a $110 strike price is basically saying you have magical predictive powers (which you don’t). Stick with high Deltas. Your wallet will thank you for it. Keeping you current with every ebb and flow of the market, The Rich Investor provides expert commentary on all things trading, investing and generating income in unpredictable and volatile markets. © 2019 Charles Streeet Research. All Rights Reserved. Use, duplication, or sale of this service, or data contained herein, is strictly prohibited.